An ulcer is a type of wound that begins via a break in the skin or a mucus membrane and does not heal in a timely fashion. They can be very shallow (superficial) or proceed to a more serious level where they extend to muscle or even bone. Ulcers often become infected and thus take even longer to heal and have been shown to be a significant factor contributing to a decreased quality of life for patients and an increase in the ever rising costs of healthcare! 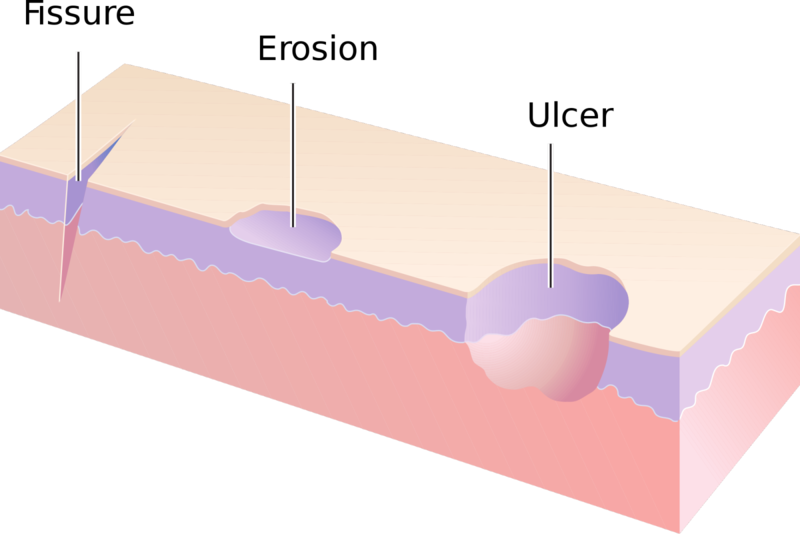 This diagram shows a few types of wounds, but specifically an example of an ulcer. There are a few different ways that ulcers can form on the Lower Extremity, but in particular we will explain venous stasis ulcers. Many people are at risk for developing venous ulcers including those with Diabetes, Heart Failure and Obesity. Tobacco usage has also been proven to worsen these issues and put the user at risk for blood clots and heart attacks. 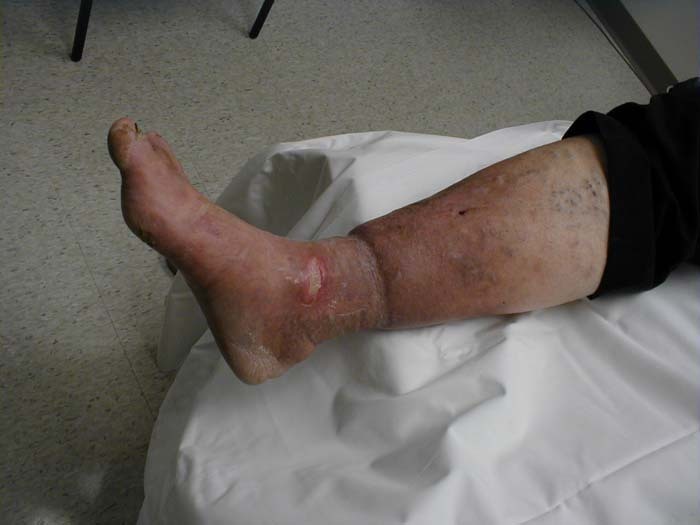 These conditions all affect vascular health and put you at further risk for developing the chronic edema and concomitant ulcers. 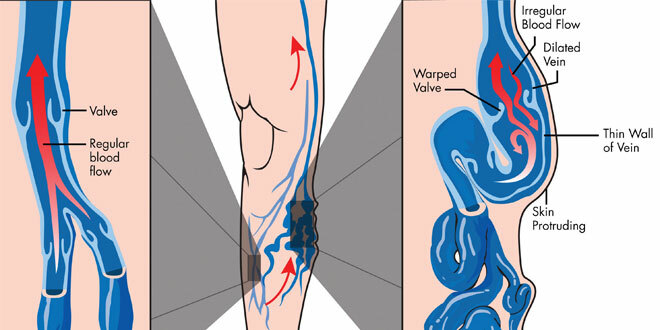 Poor circulation is the real culprit behind a venous ulcer. Veins carry the blood back to your heart after it is pumped to your feet. They are able to carry the blood “upstream” so to speak by utilizing many small valves. These valves are absolutely essential to ensuring that the blood doesn’t collect in your legs! When these valves cease to function, the veins of the lower extremity can no longer transport the blood back to the heart. Over time, because of the constant pressure of blood flow, the blood is forced out and collects in the tissues outside of the vessels! This condition called Venous Insufficiency causes swelling, pain and a discoloration of the skin over time called “brawny” discoloration. The discoloration of the skin comes from a pigment in the red blood cells called Hemosiderin. This is a serious symptom and the discoloration is permanent! The abnormal swelling causes the skin to be stretched beyond its capacity. This can be particularly problematic in older patients whose skin is thinner than that of their younger counterparts. An ulcer forms when the integrity of the person’s skin becomes compromised, either due to a traumatic event (a scratch or cut) or when the skin itself is stretched to the breaking point and is too weak to serve the normal function. Venous ulcers are treated in a multitude of ways depending on the size, number and associated complications. Firstly, it is crucial to understand that since the ulcer formed due to the chronic edema, it will not heal unless that is first managed. This can be achieved by using compression stockings and elevating the limbs above the heart to improve the venous return. Medications called diuretics may also be prescribed to help eliminate the excess water from the body. Additionally, since an ulcer is an open wound, proper wound care is essential. A wound specialist should inspect the area weekly to treat and monitor the progress of the ulcer. The wound may require mechanical debridement, which is procedure in which the physician uses a blade to remove the non-viable tissue and creates a fresh “bed” for the wound to heal. Wound care products are available now to help speed up the body’s natural healing abilities, many of which are diminished in those patients who are at risk for developing these ulcers. When an ulcer is particularly stubborn and will not heal, special measures are taken to solve the problem. These include things like skin grafts, hyperbaric oxygen treatments and even surgery to restore the veins in the legs! By utilizing proper wound care techniques this wound was able to heal beautifully. If you or someone you know needs help with a venous ulcer or symptoms similar to these don’t hesitate to contact us! Dr. Garibaldi and Dr. Kurtz each have years of experience treating these ulcers successfully by using the latest techniques and best standard of care. With the fall comes the cool weather, the dry air, the harvest and school for the youngsters! And heading back to school can mean changes in the activity levels of your children, which could translate into discomfort or injury. Many people buy their children new shoes during this time of stocking up on school uniforms and supplies. 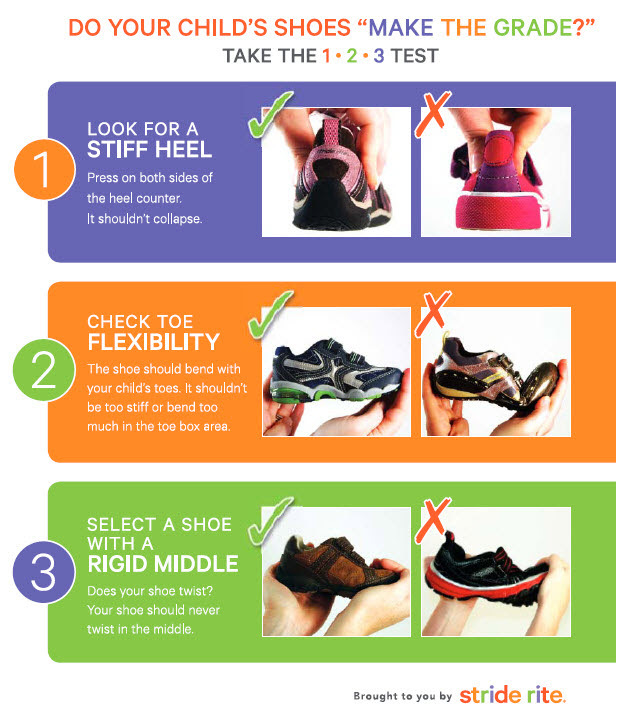 An important and often overlooked issue is buying the correct size shoe! The shoes should be sized for the larger of the child’s feet and should be comfortable. Although sometimes children may want to wear a size shoe that is too large, you should buy the correct size. A shoe that is too large can cause the foot to move too much in the shoe and result in blisters and over-pronation. Teaching and emphasizing the importance of proper shoe tying can help prevent falls and extend the life of the laces. Here’s a video of a neat trick that may help your children learn to tie their shoes even more quickly! Wearing proper shoe gear (not sandals or flip-flops!) when playing outside can also help prevent injuries like scrapes, cuts and burns to growing feet. Another issue to consider is the rigorous conditioning and training that some students undergo when the school season starts back up. A significant increase in activity levels and large fluctuations in body weight can predispose to injuries of the foot and ankle. Sprains, strains and falls should be taken seriously and you should always include your Podiatrist in helping keep your athletes healthy! One last note, with all these sports and gym classes the showers at the schools will definitely be seeing a influx of students..and with them FUNGUS! Protect your children’s feet by sending shower shoes to school with them if possible. Also, consider washing/disinfecting their shoes every few weeks! These small actions can help keep their nails fungus free and growing in a healthy way. Sweating. There’s just no way around it. Unlike our canine friends, we have the ability to release a mixture of water, salts and wastes from the eccrine glands in our skin. This process, although it can be sometimes embarrassing or annoying, allows us to regulate our body temperature and keep it within the relatively small range required for the optimal functioning of our bodies! It is estimated that around 3% of the population in the US is affected with the condition called Hyperhidrosis. It primarily affects areas with increased amounts of sweat glands, like the palms of the hands, underarm areas, groin and the soles of the feet! Sometimes this condition is genetic, but most often due to factors like excessive caffeine consumption, nervousness and wearing socks of materials that do not breathe well or absorb moisture. Besides being uncomfortable and possibly making for a moist handshake, hyperhidrosis can make everyday tasks more difficult. (Gripping doorknobs, Typing an email, sorting mail, etc.) Due to the increased amount of moisture other issues like maceration, skin breakdown and fungal/bacterial infections can occur. Fortunately, this condition can be treated with a simple product that most people have readily available. 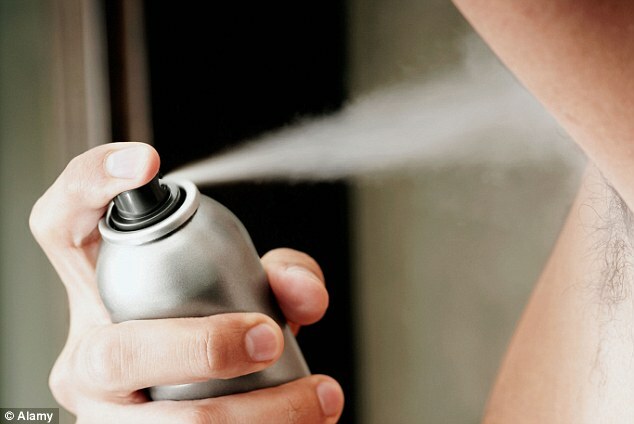 Anti-perspirant! By applying it to your feet or hands before bed and then washing it off in the morning, the Aluminum Chloride Hexahydrate dries up the sweat glands. For some cases, your doctor may have to prescribe a stronger solution in order to do the trick. There are also other types of oral medicines that may help with Hyperhidrosis, but these sometimes have adverse side effects and are not commonly used. Botox is even used sometimes to treat severe underarm sweating! Another interesting treatment modality is a procedure called Iontophoresis. This involves immersing the hands or feet in water that has a small current of electricity passing through it. The sweat glands are temporarily inactive after the procedure and it can be done in the doctor’s office or even at home with the device. If you have a problem with super sweaty feet or other issues let Dr. Garibaldi or Dr. Kurtz know and they can get you started on the treatment regimen right for you! Podiatrists commonly battle with chronic foot ulcers and venous leg ulcers in their everyday practice. Whether they are diabetic foot ulcers or a traumatic wound that fails to heal properly, these wounds can cause severe disability and may even result in limb loss or death. Complications like infections, poor blood supply, some genetic diseases, and poor oxygenation of the wound can all lead to a chronic, tough to heal wound. Hyperbaric Oxygen Therapy (HBOT) is a type of immersive treatment modality that has been in existence for many years, but is now seeing a resurgence in popularity. Originally invented to treat divers with the ‘bends’ or diving sickness, HBOT involves increasing the atmospheric pressure around the patient and essentially ‘forcing’ pure oxygen into the tissues that need healing. In the outpatient setting, HBOT is used for patients with chronic wounds, severe burns, radiation burn wounds, and even bone infections. Usually these conditions require a compression time of around 90 minutes and a pressure increase of up to 2 atmospheres – the equivalent pressure of being ten feet under water!The diving sickness and a condition called an Arterial Gas Embolism are emergencies and HBOT is usually performed under higher pressures with longer compression times in those cases. While this may sound a bit alarming to some, the process is performed in a special chamber or ‘dive-tank’ at a certified wound care center with many specialists on staff to care for you and manage your treatment. Diabetic foot ulcers (DFUs) are somewhat unique in that the consequences of the disease cause the wounds to form and create a poor environment for wound healing. Inability to feel the wound developing, decreased tissue strength, and poor blood flow due to small vessel disease all contribute to these DFUs. They most commonly develop under areas of pressure on the foot and may be chronically infected, which prevents some types of treatments from working properly. The best way to heal chronic DFUs and leg ulcers is to see your podiatrist and develop a plan to control blood sugar levels, eat a healthy diet and formulate a “plan of attack” against the wounds. While being treated at a wound care center, you can meet your doctor for the weekly sessions as needed, and utilize the instrumentation and excellent wound care staff to make your wounds a thing of the past! Dr. Garibaldi has had years of practice treating stubborn and hard to heal wounds. He is certified in Hyperbaric Oxygen Therapy and has excellent working relationships with local wound care centers. If you or someone you know needs personalized and professional wound care, give us a call today! Goldman RJ.Hyperbaric oxygen therapy for wound healing and limb salvage: a systematic review. PM R. 2009 May;1(5):471-89. doi: 10.1016/j.pmrj.2009.03.012. Pain in the Hallux or “Big Toe” can be caused by a few reasons. A fracture, Ingrown nail, Gout or a condition called Hallux Limitus. This condition is caused by a reduced range of motion in the big toe joint, which can progress and lead to pain, further reduced range of motion and even bones spurs to form, becoming Hallux Rigidus. 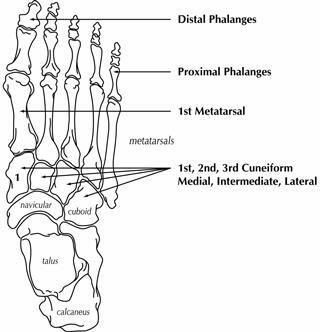 The hallux and the 1st MTPJ (Metatarsal Phalangeal Joint) both play important roles in your ability to walk! 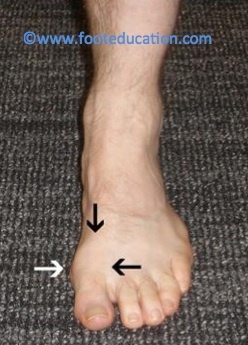 The hallux functions as a lever in the foot that pushes of against the ground during the gait cycle. The MTPJ allows the hallux to achieve the necessary amount of movement that it needs to bend the foot and create forward propulsion. There are a number of suspected culprits for this condition. Since the problem lies at an articulation of two bones, arthritic changes are suspected. (Either from Rheumatoid Arthritis, Osteoarthritis, Gout or another Inflammatory condition.) Trauma to the area, Ill fitting shoes and genetics may also play a role in developing hallux limitus. Another condition that mimics this pain is “Turf-toe”, in which the ligaments at the base of the big toe are torn or damaged. Treatment options tend to vary, depending on the severity of the deformity. While the less severe cases tend to be treated more conservatively in the beginning, the late stages almost always require a surgical intervention. Orthotics may help prevent the first metatarsal from being pushed down so much, and therefore hopefully decrease some of the “jamming” of the MTPJ. Non-Steroidal Anti-Inflammatory Medications will help reduce some of the pain and swelling around the affected joint. Transitioning from activities that involve the action that causes pain will also help reduce further damage to the joint and alleviate discomfort. A Cheilectomy may be performed in order to remove the osteophytes or bone spurs surrounding the MTPJ or even a portion of the metatarsal head to allow for more space to flex the toe. Joint Resurfacing may also help with reducing pain and swelling in the area. Arthroplasty may be a good choice if the joint is not completely damaged. This procedure involves inserting a replacement joint for the hallux. There are several different options including a hemiarthroplasty (half) or full implant. Arthrodesis or Fusion of the joint may be a last resort in your Podiatrist’s arsenal against MTPJ pain. Which procedure is performed and the subsequent, if any, complications are usually unique to your individual case. Hallux Limitus can be an annoying and even debilitating condition that can be addressed easily and usually with a favorable outcome by your Podiatrist! Cook E, Rosenblum B, Landsman A, Giurini J, Basile P. Meta-analysis of first metatarsophalangeal joint implant arthroplasty. J Foot Ankle Surg. 2009; 48(2):180-90. Martins, Darryl J., DPM. "Current Insights On First MPJ Implants." PodiatryToday. N.p., Apr. 2011. Web. 25 Aug. 2014. Equinus Deformity: A Source of Many Foot Pathologies! Pushing Yourself Too Hard on that Run Could Hurt Your Feet! Platelet Rich Plasma: Amplifying Your Body's Natural Healing Abilities! Peripheral Artery Disease: A silent but serious problem. Keep Your Footing In This Cold Front! Ingrown nails: What you can do and What you should NOT do.